What is a croquembouche or piece montee? 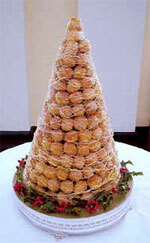 A croquembouche or “piece montee” is a wedding cake made from filled choux buns held together with caramel in an impressive pyramid. A very popular choice if there is a French connection within your bridal party and equally popular with the many other couples looking for an unusual, elegant and more interesting option to a traditional British wedding cake.